Yes indeed, it's time to make some lists. Halloween and Thanksgiving are around the corner and yes, the thought of Christmas shortly after is hanging in the air. 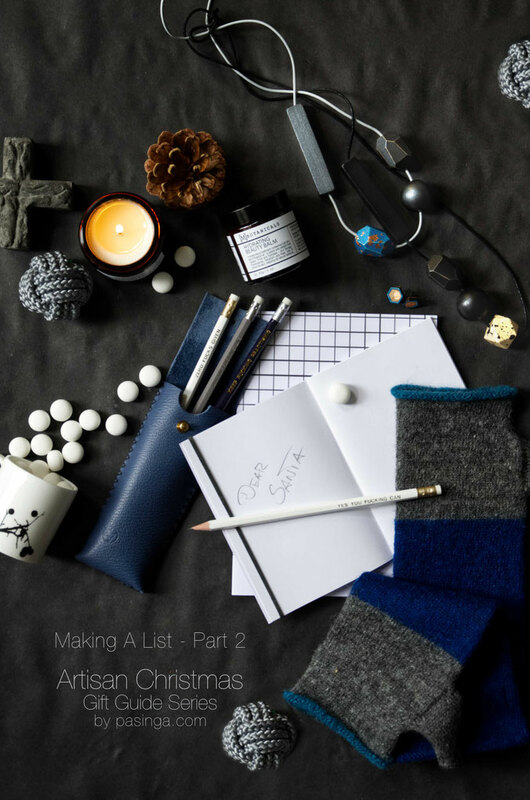 But fear not, I've got some inspiration for all those events while enjoying a good read about some lovely designer-makers and artisan crafters who would love to help us make all those festivities cherished moments! Well, let's think of autumn and winter, well all those occasions can use a good candle. And these scented soy candles by Rebecca smell so good they can make the mood in the room unforgettable! But let's not forget the beauty side of things, to ease the stress and treat yourself her hydrating beauty balm could be just the thing!?. Rebecca of mbotanicals, a natural and vegan friendly skincare range. She only uses powerful plant based ingredients as well as nature identical actives to boost the beauty of our skin. 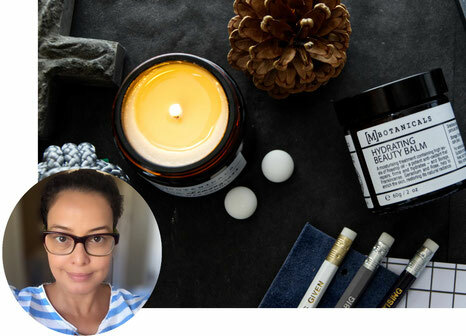 She set up mbotanicals as an expression of her love for formulating and an obsession with taking good care of her skin. Self taught with formulating cosmetics but her love of essential oils led her to study aromatherapy formally. She has formulated everything herself and hand makes all her creations in small batches so they are as fresh as they can be. It is her immense pleasure and joy to make for and hear from people using her ever evolving skin care and candle range! Tasha illustrator & designer of DirtyWorks, est. 2016 (formally known as the F**k It Society). She wanted to spread positive energy on the internet, after getting out of a personal funk. As well as cheering you on she wants to make things that do good in the wider world by using suppliers from as close to home as possible and using packaging that can be recycled. She is inspired by the conversations we're having on the internet about living and working in the 21st century. 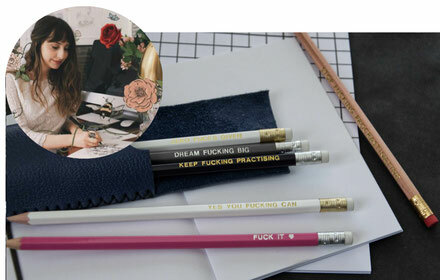 Everything from productivity hacks to the reality of self-doubt interfering with our everyday lives - creating things to keep you inspired while you work "think less, create more". Yola designer-maker of YolaWalaszek, she started making leather bags when her daughter was born in 2007. She used the nap times of her daughter to explore her creative side. She would cut the leather and do the stitching to make bags out of it. 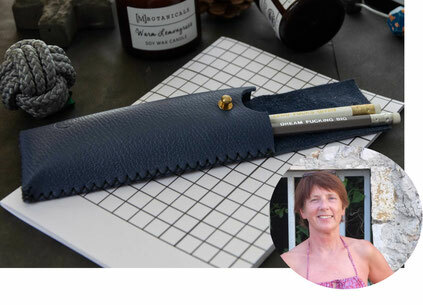 Her bag business, where often bags are one offs, grew and since she did not like to waste left over pieces her attention turned to making small accessories as well, and that’s how she came up with the idea of creating wallets, pen cases and bookmarks. 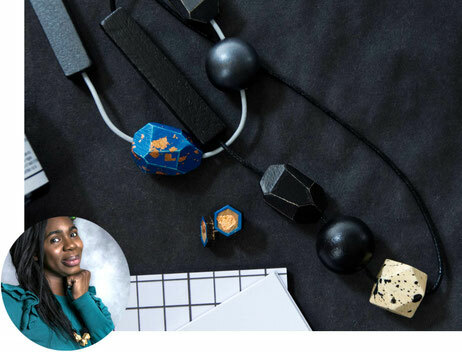 Her goal is to create practical yet quirky, simple yet functional designs. The fact that they are all handstitched with a distinctive zig zag stitch makes them different from other mainstream products. What can I say, everyone loves to look beautiful, so nothing can go wrong if you show of your treat on or all of these festivities or give these handmade gems by Nonia as special gifts. And there is that tree or branch asking for some decoration and you are guessing right, after personalised wood baubles [Part One], geometric concrete ornaments I have selected these silver grey and multi coloured Monkey Fist Knot Christmas Baubles by Emma for you! Nonia the designer-maker of PinkMushroomDesigns, takes wood beads to a new level and is giving it a good splash of colour. Growing up, she was exposed to the beauty and vibrancy her heritage offered. She loves all things natural, earthly and wood features pretty high up on the list. Being the hands-on person that she is, she tries (really hard!) to look for solutions to any problems that she might stumble upon. That includes if she can't find it, she will make it. So creating and making the perfect coloured accessories for herself and others was a no brainer! Her aim is to the point; provide beautiful and affordable jewellery which can be enjoyed by everyone. Emma artisan of AllAboutTheMonkey started her small biz after making 40 place card holders for her wedding based on a Monkey Fist knot. 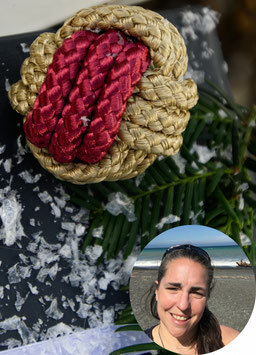 She loves Christmas and after thinking what else this knot could be she thought of the knot baubles for our trees. But the sky is the limit she is only just getting started and as these are conversation starters they have been hung on door handles, light fittings and other places to impress. She is always coming up with new ideas of things to make with them and is slowly building up the product range on Etsy around her day job - her latest addition are key rings for example. To me nothing is more thrilling than making a list, checking it twice, finding and buying the perfect gift and enjoying the bright happy smiles when all is well received. I hope you enjoyed the altogether 8 designer-maker introductions so far and are excited to see what else we got in store for you come the 10th of October. I know, I know what about the room decor? and what about Halloween? I've got some ideas for that too - so follow my blog or my social media channels to not miss a bit of inspiration! Awesome!